It’s a game of hide-and-seek. It’s also detective work; a deduction of motive, opportunity, cause and effect. Many times I’ve had conversations with homeowners/farmers who have quizzed me on my statement that they might do a better job of inspecting their homes than the professionals. Let’s face it, you probably won’t be better than the best of them but you will certainly be diligent and go to a bit of extra trouble because it is your home! Professionals issue reports with fine print giving them some loopholes — which is fair enough. They won’t accept responsibility for timbers they can’t actually see and timbers they can’t get to, for example, wooden framework between the plasterboard inside and the outside wall, roofing timbers covered by insulation and sarking and, they don’t shift heavy furniture to look at the skirting boards behind, or empty the linen press and built-in wardrobes to see what may be there. Think about it for a moment. If professionals are only going to check on the interior mouldings (skirting boards, window/door frames, etc) and the roof trusses (if they’re not covered with sarking) and, if there is no underfloor area because your home is built on a slab — my question is: what are they going to check that you can’t? Sure they have moisture meters, but meters are only used to provide a reading when the technician has already decided the timber is moist; they may have a thermal imaging camera, but that doesn’t look into the wall. It can tell them if there is a surface temperature variance that may be caused by termites — but they still have to check by tapping or looking more closely. They may also have listening equipment, but you might buy a stethoscope, however, getting back to my original comparison, there isn’t a quantum leap into infallible information by using specialised equipment. 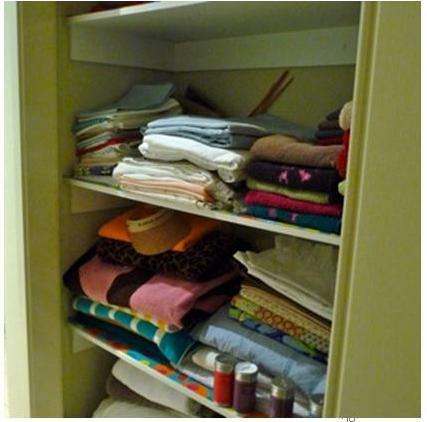 If you are active and want to save money, you can generally inspect what the professional can inspect and maybe more because you just might move the sofa and push things aside in the linen press. If you give yourself this job, essentially you’ll be looking for ‘mud’. The things to remember are: the subterranean termites will be coming from the soil and, when they leave it they use their ‘mud’ to protect themselves from light, loss of humidity and protection from ants. This ‘mud’ you’ll be looking for comes in the form of tunnels over impervious surfaces (or timber they’d rather not eat) or to pack up splits, cracks, grooves and joints in timber. 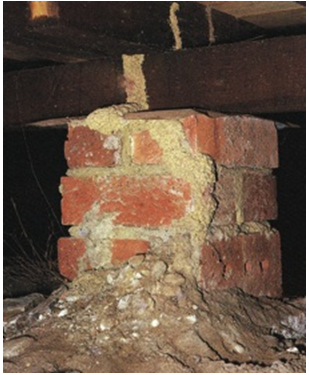 Termites are more likely to come out of soil that is damp. That probably means your garden, a low area or depression, maybe on the South side where the sun doesn’t dry the soil out, or maybe near a water tank, an air conditioning condensation outlet, etc. Termites have evolved to eat cellulose. They have protozoa in their gut that makes digestion possible, but they prefer their cellulose (timber) to be a little softened up with a modicum of decay fungi. If you wonder why or how they find timber, it is often because tannins and other trace materials can leach out of timber during rain while construction is in progress. Also, the gas by-product of fungi attacking wood is carbon dioxide, detected by the foraging scouts which then move ‘upstream’ to the source — wood! It’s how they found fallen logs in their pre-historic forest and nowadays they use this talent to find a way into your house. If you have a plumbing problem of a leak in the wall behind the shower, the termites may be the first to find it! Apart from looking for ‘mud’, you will need to look out for timber surfaces (painted or not) that are uneven or wavy/distorted. Sometimes termites only leave the paint and pressing gently you will feel the lack of solidity. Now with the blade aligned with the grain or length of the wood, you can insert it into the timber and twist (gently, always gently). Holding the little split open for a few moments, you may see the antennae or other movement of the workers and soldiers inside. Also using your ears, tapping can produce a reaction from soldiers inside the timber which sounds a little like the ratchet of an old fashioned watch if there is one or a few soldiers inside; if there are hundreds, it can sound like dragging a screwdriver slowly over very coarse sandpaper. Your tools: eyes, ears, a bright torch/flashlight, a knife or small screwdriver. 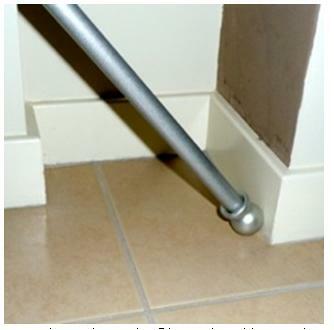 You could build yourself a long-handled sounding implement to tap or run along skirting boards without having to stoop, or to save some crawling to reach timbers in the roof or under the floor. I use a bit of left-over curtain rod with a round finial so it doesn’t scratch or mark. (See illustration). Golf putters have been used successfully. You’ll also need a stepladder to get up into the roof void and a cloth to wipe your dirty fingermarks from the manhole cover. Outside: Poke about in your garden moving the top layers of mulch and leaf litter. 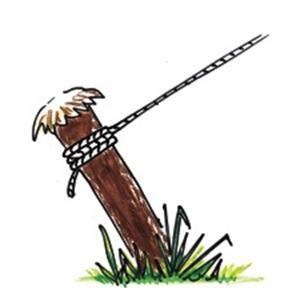 Look at plant stakes, fences, wooden steps, retaining walls, posts and wooden seats. You should even tilt big plant pots (potting mix is high in wood fibre). Look for those damper areas and relate them to the rooms closest to them so you can pay a little more attention to those rooms once you go inside — and the roof areas above them. 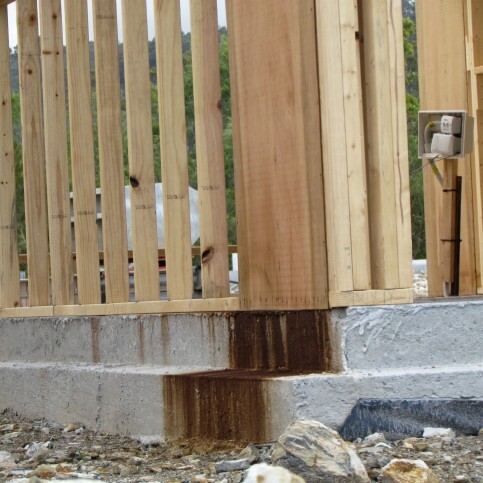 If you have a concrete slab-on-ground floor, now is the time to check every weephole. You’re looking for ‘mud’, remember? The tunnels if any, will probably follow the mortar joint between the bricks, or if no bricks… straight up and in. If plants such as mondo grass, creepers or other ground covers are blocking your view, it is time to cut them back or get out the glyphosate and kill them — your house is at stake! 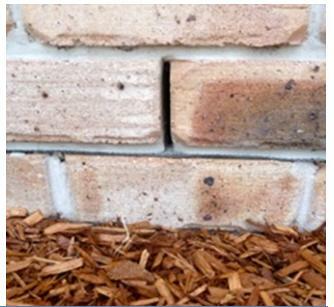 Look for possible ‘bridges’ that allow termites to traverse across from soil to the building. These bridges take many forms: pergolas, pool pump screens and pump houses, kennels, cubby houses, fences, gateposts, firewood, stacked timber. If you find anything suspicious, remember to be gentle. Alive and working termites are to be preserved at all costs because they are the ones that can take the bait back to kill off the colony. Underneath: If you are lucky (or sensible enough) to have a house you can get underneath, now’s the time. The good thing about suspended flooring is that there is more space between the timber components and the termites in the soil and there is the high probability that you will be able to detect any tunnels up the foundation walls or piers/stumps. Pay particular attention to corners, damp areas, chimney bases, and the top of the foundation walls adjacent to filled in bathrooms, laundry and patios. Of course if there are stored treasures such as boxes, taxation papers, bits of wood that might come in handy one day (get the idea?) look carefully and move anything gently and inquisitively. Inside: Start at the front door and begin tapping the architrave and skirting boards. Keep going right (or left) tapping or running your tapper/putter and your screwdriver along every moulding you pass until you are back at the front door. This is where you beat the professionals, because you will shift the sofa, the beds and you’ll look in the wardrobes and the linen press – won’t you? You can have great chemical and physical barriers; you can have monitors around your backyard like a picket fence and yes, you may have already killed off a colony or several. 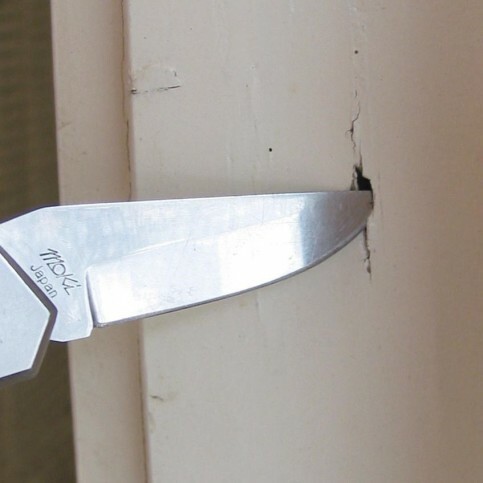 Believe me, since Captain Arthur Phillip had his first tent peg eaten by termites in 1888, termites have found a million ways to get to wood in Australian buildings. Inspecting at least once a year will give you a great chance to find evidence before a door falls off or a broom goes through a skirting board. If you live in the temperate to tropical areas of Australia, I suggest you inspect during the first week of spring and the first week of autumn, because it is not so hot up in the roof and not freezing underneath. Also, if you find termite galleries, they are more likely to be occupied. 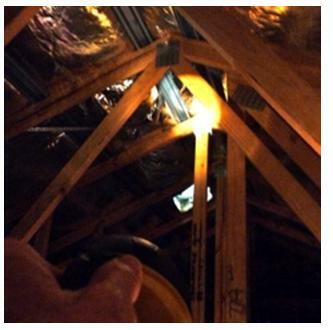 Hot timbers in a roof may be vacant during the day when you inspect and you’ll miss out on possibly hearing their return tapping.